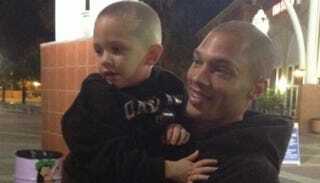 Jeremy Meeks became an Internet sensation last week after his mugshot went viral after it was posted on the Stockton, Calif., Police Department’s Facebook page. But the 30-year-old convicted felon is a working man who is not affiliated with gangs, according to a woman identifying herself as his mother, Katherine Angier, who set up a GoFundMe page in an effort to help raise $25,000 needed to secure his $900,000 bail. So far, she has raised $3,697. He is being held at the San Joaquin County Jail. His sister told TMZ that he carries guns to protect himself because of his past affiliations with gangs. She also said he’s been a practicing Christian for seven years. He was arrested Wednesday on five weapons charges and one gang charge, police say.